Get outdoors at Alcatraz Island and Muir Woods National Monument. Visit Twin Peaks and Presidio of San Francisco for their historical value. The adventure continues: take in the views from Golden Gate Bridge, cast your line with a fishing tour, take in the waterfront at Fisherman's Wharf, and get up close to creatures of the deep with a dolphin and whale watching tour. Sydney, Australia to San Francisco is an approximately 17-hour flight. You can also do a combination of flight and train; or do a combination of flight, shuttle, and bus. Traveling from Sydney to San Francisco, you'll gain 18 hours due to the time zone difference. Expect somewhat warmer temperatures when traveling from Sydney in July; daily highs in San Francisco reach 26°C and lows reach 16°C. Cap off your sightseeing on the 19th (Fri) early enough to travel to Redwood National Park. Escape the urban bustle at Redwood National Park and Trillium Falls Hike. And it doesn't end there: tour the pleasant surroundings at California Coastal Trail, hike along Lady Bird Johnson Grove, and kick back and relax at Enderts Beach. Inspirock's itinerary builder makes planning a Redwood National Park trip simple and quick. Traveling by combination of flight and taxi from San Francisco to Redwood National Park takes 4 hours. Alternatively, you can do a combination of flight, bus, and taxi; or drive. Prepare for slightly colder weather when traveling from San Francisco in July: high temperatures in Redwood National Park hover around 20°C and lows are around 13°C. Finish up your sightseeing early on the 22nd (Mon) so you can travel to Mesa Verde National Park. On the 23rd (Tue), delve into the distant past at Spruce Tree House, then trek along Petroglyph Point Hike, then trek along Nordenskiold #16 Trail, and finally delve into the distant past at Long House. On your second day here, don't miss a visit to Far View Sites, then trek along Spruce Canyon Trail, then delve into the distant past at Balcony House, and finally explore the ancient world of Cliff Palace. For other places to visit, photos, ratings, and tourist information, you can read our Mesa Verde National Park trip builder app . The Route module can help you plan travel from Redwood National Park to Mesa Verde National Park. Traveling from Redwood National Park to Mesa Verde National Park, you'll lose 1 hour due to the time zone difference. While traveling from Redwood National Park, expect warmer days and about the same nights in Mesa Verde National Park, ranging from highs of 38°C to lows of 15°C. Finish up your sightseeing early on the 24th (Wed) so you can travel to Death Valley National Park. Get outdoors at Zabriskie Point and Artists Dr. Next up on the itinerary: explore the activities along Badwater Basin, take in breathtaking views at Fall Canyon, stroll through Salt Creek Interpretive Trail, and steep yourself in history at Harmony Borax Works. To see reviews, traveler tips, where to stay, and tourist information, read our Death Valley National Park online journey planner . You can do a combination of taxi, flight, and bus from Mesa Verde National Park to Death Valley National Park in 9.5 hours. Alternatively, you can drive; or do a combination of shuttle, flight, and bus. The time zone difference when traveling from Mesa Verde National Park to Death Valley National Park is minus 1 hour. Plan for somewhat warmer temperatures traveling from Mesa Verde National Park in July, with highs in Death Valley National Park at 45°C and lows at 26°C. Finish up your sightseeing early on the 28th (Sun) so you can go by car to Yosemite National Park. 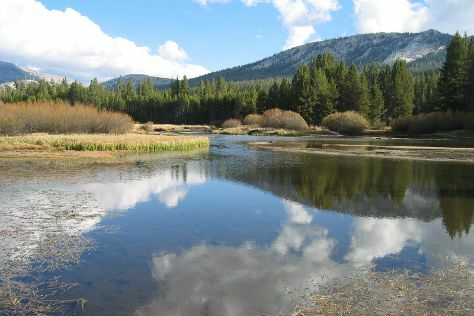 Get outdoors at Tuolumne Meadows and Mariposa Grove of Giant Sequoias. Spend the 3rd (Sat) exploring nature at Bridalveil Fall. And it doesn't end there: take in the dramatic natural features at Glacier Point, admire all the interesting features of Tioga Pass, trek along Panorama Trail, and stroll through Four Mile Trail. For other places to visit, reviews, traveler tips, and tourist information, refer to the Yosemite National Park trip itinerary builder . Traveling by car from Death Valley National Park to Yosemite National Park takes 8 hours. Alternatively, you can do a combination of car and bus. Traveling from Death Valley National Park in July, expect nights in Yosemite National Park to be colder, around 9°C, while days are slightly colder, around 33°C. On the 5th (Mon), you'll have the morning to explore before heading back home.